Detailing the physical features, habits, territorial reach and other identifying qualities of the Mexican Orange-Kneed Tarantula. The endangered Mexican Orange-Kneed Tarantula is protected by international laws so it can remain a part of its natural ecosystem for generations to come. Tarantulas are magnificently large and extremely hairy. Including legs, some can grow as long as 150 mm. This particular species has bright orange patches on its "knee" joints and lower legs joints, and it is this unique coloration has actually led to their decline. 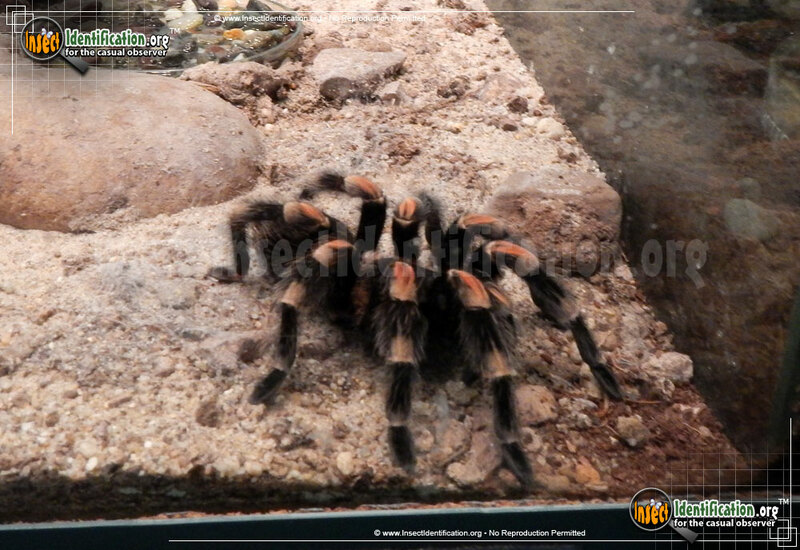 Orange-Kneed Tarantulas became popular pets and were taken from the wild and sold in stores. Their trade has now become illegal and they are now protected as an endangered species after being placed on the CITES list. Males are generally smaller and thinner than females, though their legs are longer. They are territorial and aggressive with other intruding males. Females are larger and live longer by an average of 10-20 years longer. Males generally live about 10 years, an age about when they become sexually mature, and then they die. Nocturnal in nature, they are most active at night and are hunters, not spinners. They may use their silk to line their daytime hideouts, but not to catch prey. North American tarantula venom is not lethal, but bites can be as painful as a bee sting. Also, the bristles on the spider's abdomen break off easily and can penetrate skin, causing irritation and redness on both prey (i.e. mice) and people trying to handle them. This type of spider is generally best left as a 'look, but don't touch' species.